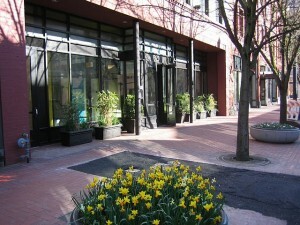 I recently spent some time at Souk, a co-working space in Portland. It’s a great space with lots of room and lots of light, which is important when you’re going to spend hours on end somewhere. Over the course of a couple days, it became apparent that there are several tools that can help facilitate the coming and going of people in spaces like these. CloudKnock is an application built using Tropo to facilitate letting people in to co-working spaces. When you need to get in, you can text “knock knock” to the application’s phone number. The application will then forward your message on to anyone who has checked in to the space. Since it uses Tropo it works not only by SMS but also by AIM, MSN, Yahoo IM, or Jabber! This means your “knock knock” SMS can be seamlessly forwarded on to people sitting at their desks using Gmail chat or AIM. While this app won’t actually open the door for you, that also means there is no physical hardware to install making it feasible to start using it today! 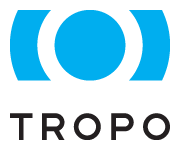 Download the source code on Github, and sign up with Tropo to get started. Have you ever wondered where someone in your group ran off to at lunch? Wouldn’t it be great if you could find out where they are without having to call them or text them and wait for their reply? 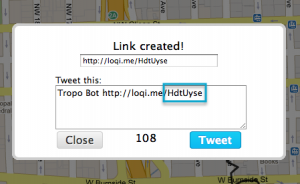 Using Tropo, you can just send a quick IM to a bot which can find out where they are if they’re using Geoloqi. Every person who you want to track should download the Geoloqi app for iPhone or Android. From your map page, create a new shared link which never expires. Copy the token at the end of the URL that is created, and paste it into the users array in the script. Copy the sample code into a new Tropo scripting application, and add the Geoloqi shared link tokens for everyone in your group you want to track. You can give people nicknames so they can be identified by multiple names. 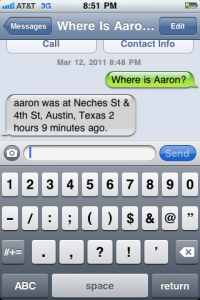 Then, you can send a message (via SMS or IM) like “Where is Aaron?” and you’ll get a quick reply with your friend’s location if they’re tracking themselves using Geoloqi! Say you want to register a couple different typos of your domain name, and redirect everyone seamlessly to the correct site. This can be done quite easily in Apache using ServerAlias and a simple RewriteRule. I just registered geoloqui.com after noticing a couple articles linking to it instead of geoloqi.com. But then I thought, wouldn’t it be useful if I could track these typos and see which ones are most common? Turns out it’s not difficult! This will make domain typos visible in Google Analytics under the "All Traffic Sources" section. You can clearly see the referrals from the typo'd domain name at the bottom of this list. 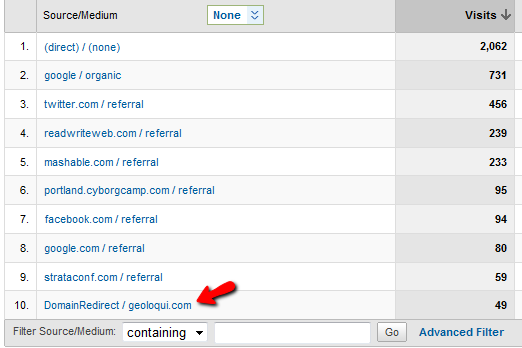 You could also use the filter box to search for "DomainRedirect" and see only the typos. I'd be curious to know if anybody else has other suggestions for tracking this type of thing.